Choosing the right memorial to represent your loved one can seem an impossible task. Here, at Hunt and Sons Memorials, we strive to provide each of our customers with caring and supportive experience to alleviate this heavy burden. Our unique blend of compassion and expertise allows us to provide you with a multitude of choices from custom impact-etchings to personalized engravings. We understand the delicate nature of this time in your life, and our belief in working closely with our customers ensures that each memorial will be an expression of your love and respect. Our personal interest in each customer demands that we produce only memorials of the highest quality craftsmanship with a lowest price guarantee. At your earliest convenience, we encourage you to stop by 2655 E. Main Street, Danville, Indiana 46122, meet our family, and view our beautiful, custom memorials. With hundreds of options to choose from, ﻿our ﻿indoor/outdoor﻿ display area﻿ allows our customers to visit with us anytime. We offer many columbarium designs for churches, cemeteries, communities and other institutions. These designs are available in a variety of shapes and in many granite colors. We also offer many cremation memorials for individual and family needs. 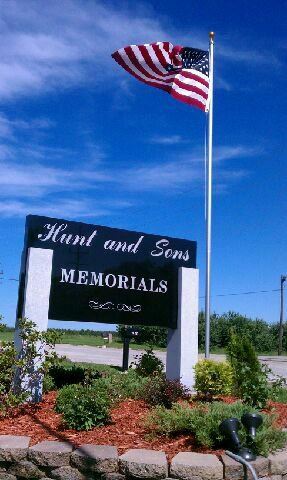 In an attempt to better serve our customers, Hunt and Sons Memorials regularly selects new and unique memorial options to add to our already wide array of options. As part of our newest arrivals, this hand-carved, column memorial is sure to draw an astonishing amount of attention. As our selection of memorial choices grows, it is our hope that we will meet and exceed all of our customers' expectations. We understand that each individual has a story to be told, and his/her memorial should be as unique as his/her life. Stop in to check our the newest additions to our individual and memorial companion memorials selection.